Parents you can now order prints of your child\'s art to make it a lasting memory on your living room wall or Pin it on Pinterest. All from within the app! We have improved the user experience and fixed minor issues as well. The app has been updated just in time for Summer, kids can get creative with the new \"Caring & Sharing\" and \"Ocean\" coloring books!! 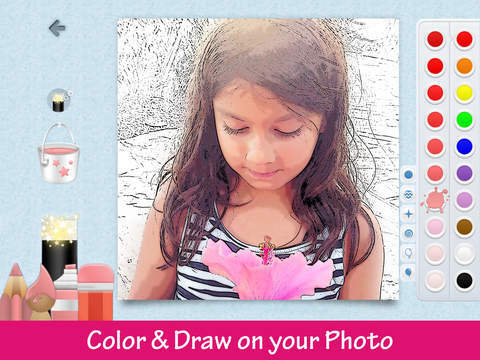 Let the kids get creative this summer with Mini Monet. Award winning Coloring Book with over 120 Coloring Pages, 40 Stickers, 20 Stamps -- FREE. Featured by Apple in their "Kids Apps and Games We Love", "Best New Apps", "Get Creative", "Let's Color", "Inspire Creativity", "WOW your Kids" and "Lets Draw" list of apps for Kids. Mini Monet is a creative playground for little kids. Children can explore various art styles with easy to use tools, capture their creative ideas on blank pages or simply get creative with coloring. Connecting children through art ~ Mini Monet has an Art Club powered by the creations of little artists. Inspiring Creativity with weekly art challenges, Mini Monet keeps the little artists busy. Mini Monet has been created for little artists. It has a unique "Magic Pencil" which helps you stay inside the lines for more fun and creativity! Mini Monet is a complete Art Studio with all the tools required by a little artist. o Coloring Pages, 100+ categorized pages. o Fun weekly challenges will keep the creative ones busy. o Challenges are age appropriate and full of surprises. o Get Two new stickers with each challenge!! Mini Monet has an Art Club powered by the creations of the little artists. The Art Club is a safe environment for children to share their art with others, see what other artists have created and appreciate their work and be creative! Kids get rewarded with virtual coins as they use the app. They can use the coins to get bonus content from the Art Store! Weekly Creative Challenges in the app, endless inspiration!! A secure parent zone in the app let's them adjust the sharing and settings for the app. Parents have full control in the app. Sprite Kids values and respects the privacy of children. As a MOMs with Apps member, we follow the "Know what's inside" best practices for kids’ apps. We do not collect, store, or share any personal information or location data other than what is needed for internal operational purposes. Neither our free or paid apps have advertisements, or hidden tracking software. Sprite Kids creates learning environments for children which spark creativity, instill a love for reading and which guide them to think logically. Mini Monet was designed with love for the creative little artists.